Show Me The Homes was founded by a Realtor® and began providing real estate marketing services in 2000. With a real estate industry background, we understand buyers, and over the last decade we have built our SmartShowing Tours™ around an understanding that evolves with real estate marketing trends. Every buyer has specific features that are important to them. It may include a large back yard, a family-functional kitchen area, or panoramic views. Whatever features are meaningful to a prospective buyer, in a SmartShowing Tour they can get right to those particular scenes of interest with a single click or touch. Most other tours require something like scrolling through an often unorganized and ungrouped carousel of thumbnail images. Our SmartShowing Tours' sophistication lies in it's simplicity. Grouping puts scenes into context. For example: as prospective buyers consider whether the bedrooms in your listing meet their particular needs, they can easily visualize which rooms are upstairs, downstairs or on the main floor. No other tour communicates this kind of simple, visual organization. Buyers Browse Their Way... Fast. 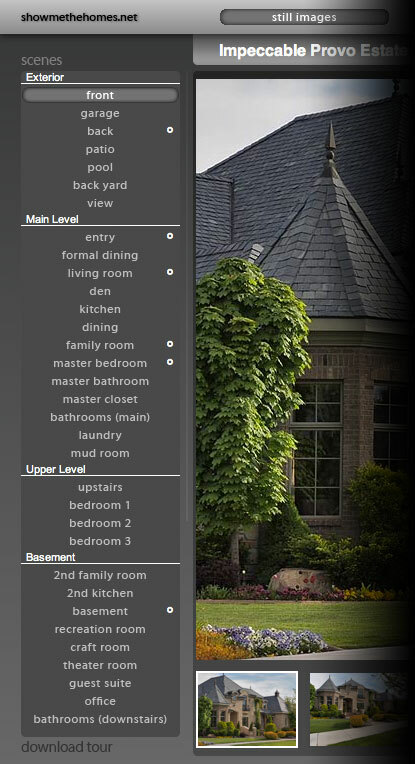 Also unique to Show Me The Homes is the concept of customizing our SmartShowing Tours to the listing, rather than adapting a listing to tours with a predetermined image quota. A few buyers like to browse a few images to gain familiarity with the property, most buyers want to see a lot of photos. SmartShowing Tours accommodate both preferences. Simply clicking through the scenes organized on the left gives a brief tour of each area a specific buyer has an interest in—in a matter of seconds. At any point, a buyer may decide to explore any given scene by clicking through the up to 5 available thumbnail images present within each scene. Click here to learn more about our additional SmartShowing Tour navigation innovations on our mobile devices page.